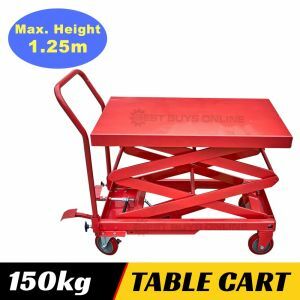 This hydraulic lift table cart has been designed for heavy lifting in workplaces, shops and warehouses. SUPERIOR: maximum lifting height - up to 1.3m, heavy lifting capacity of up to 350 kg. SMOOTH & EASY LOADING or UNLOADING: Fully adjustable to meet your required height. This double scissor lift cart is equipped with foot pedal for easy operation, while also being easy to lift and lower with the handle. 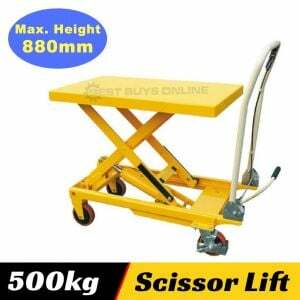 DURABLE CONSTRUCTION: Made of high-quality steel, this lift table has been built to last. STABILITY & EASY MOVEMENT: Included four strong wheels, you can move this Hydraulic Cart around your workshop or garage easily. In addition, its compact design allows it to pass through doors, move around or storage easily, which is ideal for those who have a limited workspace. Lifting capacity: 350kg and a maximum lifting height of up to 1.3m. The lowest table height is 350mm. The table size is 910mm x 500mm x 53mm. Packaging Dimensions: 105 x 65 x 56cm, 111kg.